While writing a brief post for the CCA today about 19th-century "portable buildings" and their unexpected role in facilitating the European colonial project, I stumbled on the "portable camps" of Canadian shelter firm Weatherhaven. [Images: Multiple projects by Weatherhaven]. Weatherhaven was founded, historian Robert Kronenburg explains in his book Portable Architecture, "in 1981 by the merging of two separate businesses, an expedition organizing team and a Vancouver-based construction company." 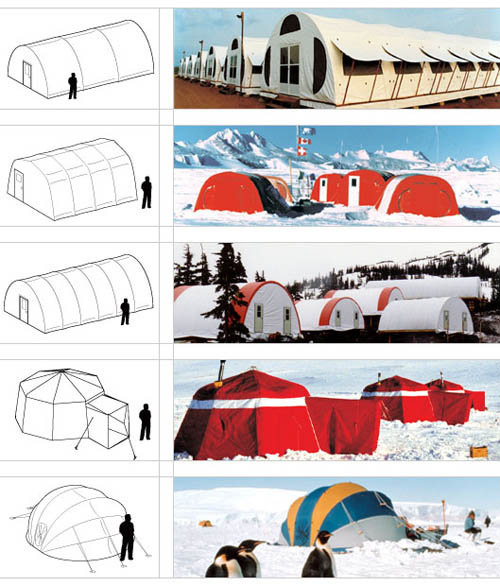 The founders recognized the need for a dedicated approach to the provision of temporary shelter in remote places and developed a strategy to provide a complete service including design, manufacture, packaging, transportation, and erection of buildings, all of which would be created specifically to respond to the logistical problems of remote deployment in harsh environments. 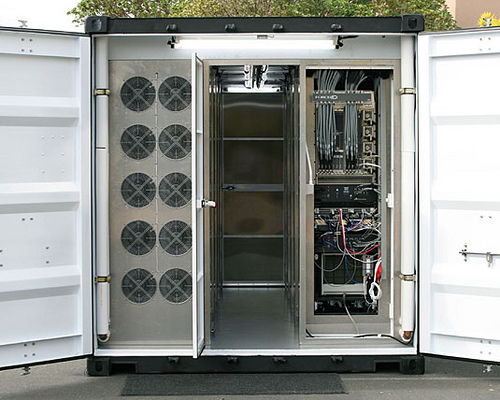 For Weatherhaven, this includes the production of whole "Geological Survey Camps" and "mining villages," among many other examples, almost all of which are capable of being rapidly deployed and air-delivered by crate. It is Flatpak City: pop open the box and go. "The first stage of the operation," Kronenburg writes, referring to a specific example of their cities-on-demand, "was to establish a Weatherhaven crew shelter so that a construction team could prepare a temporary landing site for heavier aircraft." From that initial seed, a whole civilization-by-airfield could be grown—an instant city from the sky. "A single crate was flown in by light aircraft and the building was assembled and in use within four hours." The team then prepared the camp layout, and as the rest of the building components and other equipment were flown in, assembled the entire facility... The completed facility included sleeping and leisure accommodation, a 24 hour kitchen, showers, and toilets, a hospital, offices, and an engineering base, and was built in 20 working days. The buildings themselves are neither architecturally nor materially interesting, Kronenburg adds, but they "are remarkable for their organizational and logistical approach." It is just-in-time urbanism: parachuting in whole cities and logistical systems till a new, geographically remote metropolis is up and running in less than three weeks. [Image: A military village by Weatherhaven]. These temporary mining villages and other extraction towns—somewhere above the Arctic Circle or deep in the desert, "often so remote as to be invisible to most of the world"—unfold in an industrial nanosecond. They stick around for mere years and then disappear, leaving no real archaeological traces, producing no tourist postcards, finding no place on any map, perhaps never even achieving the status of a formal name, yet nonetheless managing to house thousands of workers at a time. What role should such compounds play in the writing of urban and architectural history? At the very least, these "longer-stay remote shelters," as Kronenburg calls them, are surely as vital to the global economy—with deep connections to the extraction industries, from diamond mines to tar sands—as the banking district of a recognized urban conglomerate. How ironic it would be to discover someday that an instant village for 2,000 residents, air-delivered by Weatherhaven into the emotionally bleak but mineralogically rich Australian Outback, has a larger economic footprint than the entire business district of a city like Sydney. In many ways, I'm reminded of an article published last week in which we read that "Cisco Systems is helping build a prototype in South Korea for what one developer describes as an instant 'city in a box'." Delegations of Chinese government officials looking to purchase their own cities of the future are descending on New Songdo City, a soon-to-be-completed metropolis about the size of downtown Boston that serves as a showroom model for what is expected to be the first of many assembly-line cities. The idea that a government—or private corporation—can simply "purchase their own cities of the future" is a fascinating and oddly troubling one. "Five hundred cities are needed in China; 300 are needed in India," an excited developer explains—so why not simply "purchase" them from the cheapest or most reliable supplier? Cities will be things you have delivered to you, like pizza, and they and their residents will be treated just as disposably. 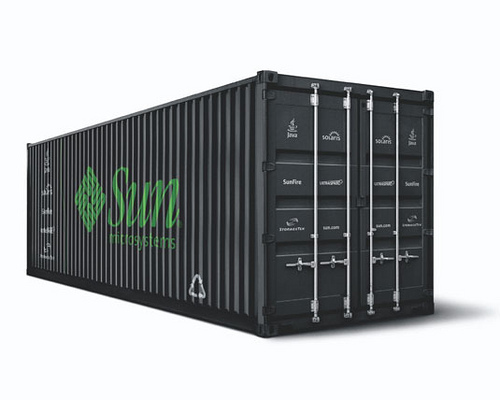 [Image: The "modular datacenter" of Sun's Project Blackbox, a stackable, shipping container-based, portable supercomputing and data storage unit]. Offloading a few of Sun's Project Blackbox units, seen above, in order to construct a privately chartered city-in-a-box, based around a remote airfield somewhere in the Canadian Arctic, is something as likely to be seen in a Roger Moore-era James Bond film as it is in the corporate spreadsheets of a firm like Rio Tinto; but I'm left dwelling on the question of where these sorts of settlements belong in architectural history. Purpose-built instant cities "purchased" wholesale from private suppliers, and erected in as little as one month's time, are only going to increase in quantity, population, diversity of purpose, and global economic importance in the decades to come; their impact on political science and concepts of sovereign territory and constitutional law is something we can barely even begin to anticipate. But if architects have more to learn from the international warehousing strategies of Bechtel than they do from the Farnsworth House or the software packages of Patrik Schumacher, then what role might firms like Weatherhaven prove to have played in transforming how we understand the built environment? Put another way, should the COO of Weatherhaven be invited to contribute to Icon's next "Manifesto" issue? If so, what might architects and urban planners learn? The national cultural event, Imaginez Maintenant, features work of young multidisciplinary designers (all under the age of 30) in nine French cities. 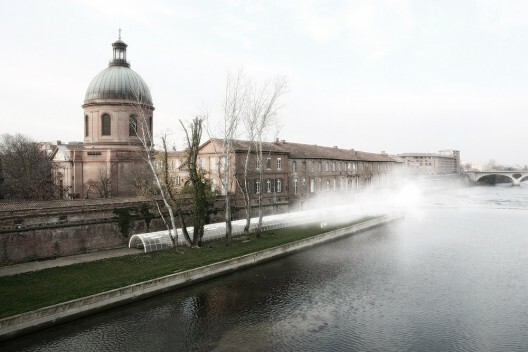 Finding inspiration in Gilles Clément’s description of “wandering plants phenomenon,” Nicolas Dorval-Bory and Raphaël Bétillon’s selected project creates an experimental journey, inviting visitors to explore an unlikely landscape. 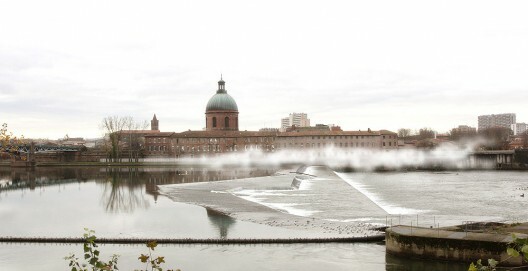 Open from July 1st through the 4th, the project consists of an artificial cloud, a long greenhouse and thousand of seedlings which will rest on the banks of the Garonne, next to the Hospital of La Grave. In this bright tunnel, visitors choose one of the 2000 plants to take with them on their journey. 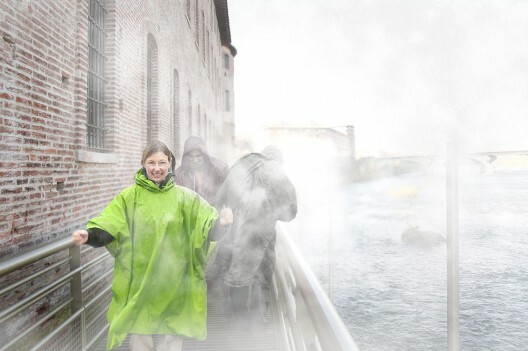 With seeds in hand, visitors penetrate a thick cloud formed from a dense mist from the spraying of the Garonne river through 1000 nozzles (installed by French company Dutrie, one the offices who carried out DS + R’s Blur Building). 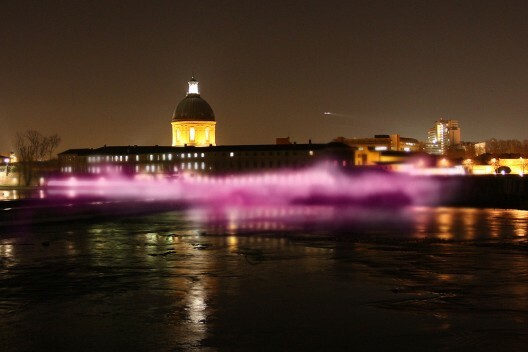 The cloud provides an eerie, distorting surrounding that will change colors in the night as it blankets the river. 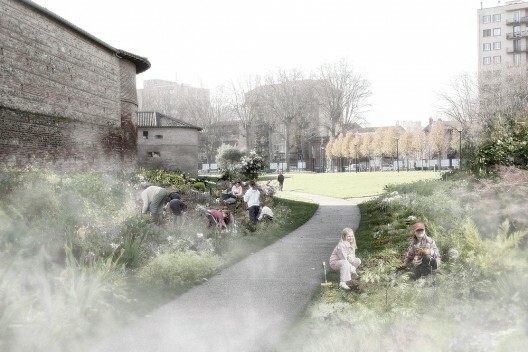 The 100 m long cloud experience allows the visitor to become a part of an abstract, disconcerting humid environment and upon reaching the end, a luscious garden beckons the visitior to plant his selected seedling. 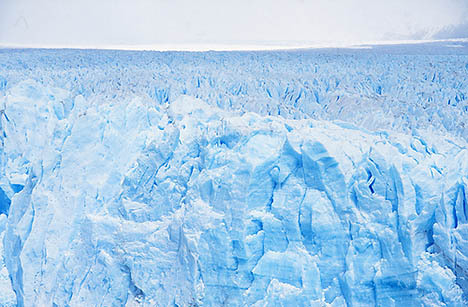 The installation deals with ideas such as invisible landscapes and climatic distortion, combining them into a sensory experience that will surely captivate visitors. "Paysages en Exils", nice title for an interesting project. It reminds me so much of a project we did last year (unpublished on our website yet, unfortunately --but will soon be...--) that was named "Les Jours Migrants (Boréals/Australs)". The same sort of idea. Unrealised as usual... Or the project we are currently working on for the Frioul Islands in Marseille, "Fenêtre Arctique" (Arctic Opening) --even if this last one is only based on lighting, due to budget restrictions... (but should be realised therefore!)--. 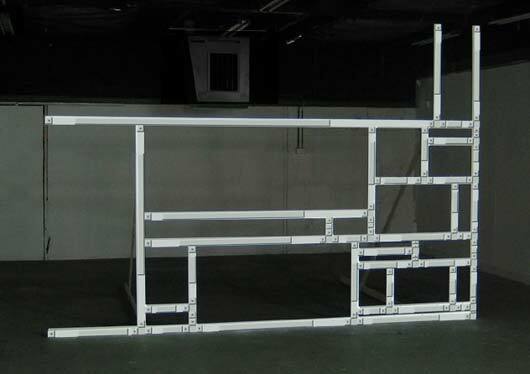 It really triggers this idea of distortions, or spatial interferences that we try to develop in our own work for some time (RealRoom(s), Tower of Atmospheric Relations). Of course, it also reminds us a bit of Blur, Diller & Scofidio iconic project in Yverdon. But it's quite different though.